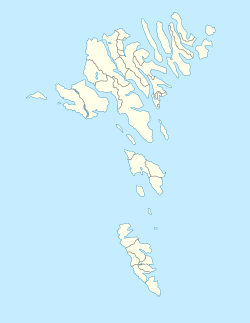 Norðskáli (Danish: Nordskåle) is a settlement in the Faroe Islands on the island of Eysturoy, a few kilometres north of Oyri. Its name means north dwelling and its population is 295. The 226-metre Streymn Bridge crosses Sundini from the island of Streymoy between Norðskáli and Oyri. Since the bridge was opened in 1976, a settlement named Oyrarbakki has grown up near the bridge, with a large school, shops and a post office. ^ a b Brandt, Don (2006). More Stamps and Story of the Faroe Islands (PDF). 1. Tórshavn: Postverk Føroya. p. 38. ISBN 99918-3-191-6. Archived from the original (pdf) on 2011-09-27. Retrieved 2008-09-04. This page was last edited on 12 November 2018, at 22:18 (UTC).